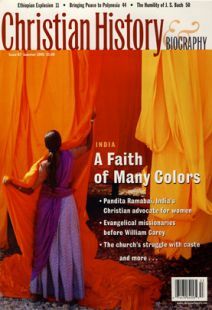 THE STORY OF CONVERSIONS in India is an excellent example of the indigenous discovery of Christianity (rather than a Western Christian discovery of indigenous societies). No culture is sacred but every culture has the potential to become so. Throughout history, Christian faith has transcended ethnic, national, and cultural barriers, reshaping and redeeming the cultures it has entered. But Christian faith has also taken the shape of those “host cultures” as people in each culture recognize resonant themes in the faith. Missionaries from abroad bring an initial stimulus, with new technologies for transmitting both Scripture and science. Those technologies serve, together with local agents, to “translate the message” into idioms that are locally acceptable and attractive. After an incubation period—during which early converts absorb, thoroughly internalize, and adapt the gospel to their own culture—explosions of spiritual energy turn whole communities to the new faith. Nowhere can this pattern be more clearly seen than in the process that culminated in Tirunelveli (then spelled Tinnevelly). From 1799 onwards, whole villages forsook old ways and turned temples into chapel-schools. Christians doubled or tripled their numbers in every decade thereafter. This story starts in eastern Germany—in Halle and Herrnhut, the wellsprings of Pietism. Evangelicalism and Enlightenment were twin engines in A. H. Francke’s vision of bringing universal literacy and numeracy to every person on earth—man, woman, and child—so that each might gain access to God’s Word in his or her mother tongue. Ziegenbalg came to Tranquebar on the southeast coast of India in 1706. He built the first modern Tamil schools, printed schoolbooks, scriptures, and scientific studies. As small congregations and trained Tamil pastors and teachers proliferated, the Halle vision spread to more and more villages in the Tamil countryside. By the 1730s, Tamil evangelical leaders such as Aaron and Rajanayakkan had gained royal patronage and were building the first model school in Thanjavur. Forty years later, disciples whom C. F. Schwartz (one of Ziegenbalg’s successors) had trained at higher-level schools in Thanjavur were fanning out, two by two, across the peninsula, until their chapel-schools reached Palaiyankottai in Tirunelveli Country. Schwartz, perhaps the most remarkable of all Halle missionaries in India, was adept in Tamil, Telugu, Marathi, Persian, Sanskrit, Portuguese, and other European languages, both modern and classical. A skilled preacher, teacher, schoolmaster, diplomat, and statesman, he ended his 50-year career as Raja-Guru, Protector-Regent, and “Father” to Serfoji, Maharaja of Thanjavur. By then, gifted disciples he called “Helpers” had gone far and wide—from Tranquebar to Tiruchirapalli, to Tirunelveli, and even as far as Travancore (almost 300 miles away). This outreach occurred during times of ceaseless war, famine, and suffering. It took place in the face of implacable opposition to Christian missions from the English East India Company, whose forces were then extending their rule over much of the subcontinent. Missionaries from abroad deserve only limited credit for the efforts that turned Tamil communities toward Christian faith. Time and again, adventurous and gifted converts brought the gospel to their home villages in their own tongue. Schwartz’s disciples illustrate this. As early as 1769 a Vellalar (from a high caste that had created a proud classical Tamil civilization) Christian soldier stationed with the East India Company’s garrison at Palaiyankottai wrote Schwartz about his small congregation, begging for a pastor. In 1778, Schwartz himself came to Palaiyankottai. While there, he baptized an affluent Brahman widow whom he already knew. Christening her “Clarinda,” he gave her a place of leadership within the small congregation. Clarinda, with help from a Vellalar catechist-disciple named Rayappan, ran the local school and endowed the building of a proper (pukka) “prayer/school” hall. She was not satisfied until her small congregation had its own full-fledged and properly trained pastor-teacher. The person sent to tend the congregations was Satyanathan Pillai. Satyanathan came from a highborn Vellalar family in Thanjavur. A veteran Schwartz disciple, he had served as pastor-teacher of the suburban village “prayer hall” as well as the city congregation of Thanjavur. When Satyanathan first came to Tirunelveli in 1783, Schwartz also recruited a brilliant youth named Vedanayakam Pillai and took him back to Thanjavur where, in due course, he became the most renowned Tamil scholar-writer of the age. The Maharajah later recognized Vedanayakam’s achievements and bestowed on him the title of Sastri (Master of Learning). Meanwhile, from 1790 onward, after he was ordained as the very first Tamil evangelical missionary, Satyanathan began to lead what was to become India’s first extraordinary and rapid Christian conversion movement. This process accelerated in 1797. A young Shanar (low-caste) convert, Sundaranandam David, returned from Thanjavur and launched a radical bhakti (or “spiritual or devotional") movement among his own people. Schwartz, aged and failing, had trained and sent him to help Satyanathan. The movement began when Sundaranandam’s relatives, blinking their eyes at his sudden appearance as if from the dead, heard the wonders of his conversion. Soon after they themselves had embraced the gospel, four families at Vijayaramapuram, not far away, asked for instruction. Then Shanars at Shanmugapuram and surrounding villages also joined him. Satyanathan and Sundaranandam found themselves talking and talking with people who allowed them “not even a quarter of an hour’s leisure.” For 16 days, they worked night and day. Shanars, treated with respect for the first time in their lives, responded in droves. One relative explained, “I am glad to see that you behave so kindly towards us and make no distinction of caste.” Whole villages began to turn Christian. Soon, thousands of Shanars (who now began to call themselves “Nadars,” or “Lords") flocked to embrace the new faith. This, in turn, aroused the wrath of landlords. Fearing loss of the free labor landlords believed was due them, they called for the warlords. Toughs and “club-men” from Ramnad descended upon the new communities and “plundered, confined, and tortured” them, pulling down their mud-thatch huts and prayer-schools, burning their books, and exposing them to insults, intimidation, and violence. This persecution coincided with wars then tearing apart much of south India. Beyond fortified towns and villages, devastation, famine, and pestilence stalked the land. Thousands of Christians lost everything and saw lives destroyed, prayer-schools and dwellings pulled down, property taken, and families beaten, stripped, and sent into the jungle to die. Sundaranandam, charismatic and fiery, led the movement after Satyanathan’s health began to fail and he retired to Thanjavur. Thereafter, constant persecution and martyrdom set a pattern that would be replicated in other movements of mass conversion. During the century that followed, whenever whole villages turned Christian en masse, persecution would follow. Desperation inspired creativity. The first “Village of Refuge,” modeled on biblical lines, was called “Mudalur” or “First Village.” It was so successful that other settlements soon followed (i.e. Bethlehem, Nazareth, Jerusalem, Samaria, Galilee, Megnanapuram, Sawyerpuram, Anandapuram, Dohnavur, and many more). Voluntary “self-help” societies were formed within each village to care for the needy, those fleeing their homes, the sick, poor, widows, and orphans. As numbers of Christians doubled, missionaries began to arrive. They helped to build institutional infrastructures. Eventually, schools, printing presses, colleges and seminaries for training leaders, and hospitals followed. Pietistic communities of Tirunelveli Country became so numerous, prosperous, and strong that in the long run they helped, in some measure, to transform local Hindu culture and society. In 1816, James Hough, a military chaplain and disciple of Cambridge pastor Charles Simeon, arrived. He had forsaken a Church of England “living” to serve God in India. He found 53 thriving congregations meeting in thatch-roofed prayer-houses, where children recited Scripture and copied verses onto palm leaf (cajan) books, and where worshippers tarried to sing hymns “to a late hour.” They gave him a joyful welcome. Hough opened schools, using his own funds to erect small buildings, hire schoolmasters from Thanjavur, and buy books from Tranquebar. By 1819, with help from the Society for the Promotion of Christian Knowledge (S.P.C.K.) and the Church Mission Society (C.M.S. ), 15 Tamil schools were serving 551 students and two English schools were teaching 59 students. Two more “villages of refuge” were also founded, Pohlayarpuram and Houghayarpuram. The arrival of Karl Rhenius in 1820 radically transformed prospects for Tirunelveli’s evangelical Christians. An ex-soldier from Berlin, with Moravian leanings, he had come to India under the fledgling C.M.S. at a time when the English were hard to enlist. He was later described as “one of the ablest, most clear-sighted and practical, and most zealous missionaries that India has ever seen” and as the “Apostle to Tirunelveli.” A charismatic and fiery individual with a superb command of Tamil, he had a vision for social revolution. “Pilgrims,” again trained and sent out two by two across the countryside, quickly brought fresh outbreaks of mass conversion. Shanar (a.k.a. Nadar) villages were the most responsive, but converts also came from other communities, including some landholding Vellalars. Again, whole villages turned Christian. Sometimes converts threw images of village deities into wells and transformed local temples into prayer-school halls. Again, when persecution broke out, new villages of refuge sprang up. Dohnavur, for example, was endowed by a Swedish-Prussian Count to whom Rhenius had written. It was here that Amy Carmichael would later establish her well-known ministry to girls fleeing temple prostitution. One strength of this movement lay in its inner support structures. Tirunelveli congregations themselves, among their hundreds of schools, systematically promoted female education and fostered voluntary societies for charitable purposes. In every Christian village, congregations assembled each morning and evening at the ringing of a bell for united prayer. Each congregation was governed by its own panchayat or “council of five,” the pastor and schoolmaster sitting with headman and elders, so that conflicts could be resolved and standards of behavior maintained. Following the Halle pattern, within a system of universal education, each person was continuously drilled in truths of the faith. All, old and young alike, were expected to memorize and recite Scriptures, doctrines, and duties. Small groups examined each other in basics. Baptism and communion could be delayed, sometimes years, until rigorous tests were passed. 1831, overarching structures had begun to knit congregations together. Coffers of the Dharma Sangam remained full, reaching 13,320 rupees in 1858 (a rupee, then worth half a dollar, could feed a family well for a fortnight). The Bible and Tract Society (and Press), founded in 1822, printed 45,000 tracts and boasted a 1,237-rupee surplus. The Shanti Sangam (Peace Society), Suvisesha-fanam ("Gospel-penny” or Poor Fund), Widow’s Fund, and Missionary Society that sent its members (known as Desanthari or “Pilgrims") to every village where no conversions had yet occurred, along with several hundred schools and two colleges for training leaders (some teachers being non-Christian Vellalars), were all locally supported. The story of Tirunelveli evangelical Christianity provides a template that can be applied to the story of every other major conversion movement in India over the past two centuries. The same pattern of Christian expansion was replicated among Pulaiyars in Travancore (now Kerala), among Malas and Madigas in Andhra, as well as among all the aboriginal peoples, such as the Khonds, Mundas, Santals, Garos, Mizos and Nagas, dwelling along the forested escarpments of India’s internal and external frontiers and maritime shorelines. Hundreds of such stories, each reflecting unique peculiarities of its own processes of inception, incubation, and expansion under indigenous impetus, can be told. Robert Eric Frykenberg is professor emeritus of history and South Asian studies at the University of Wisconsin-Madison.